In the excellent article Man in Nature: The Fiasco of Suburbia (published in Orion Magazine, Spring 2001), James Howard Kunstler makes a fascinating argument. He believes that we need to stop focusing on "saving the environment" and rather start focusing on saving the "human habitat." "We are never going to save the rural places," writes Kunstler, "or the agricultural places or the wild and scenic places (or the wild species that dwell there) unless we identify the human habitat and then strive to make it so good that humans will voluntarily inhabit it." As a result of our terrible urban landscape, people flee into the suburbs and the suburbanized countryside, blurring the distinction between the wild places and the people places, ultimately destroying both habitats by creating No Place. He speaks to Environmentalists when he writes: "Stop yammering about open space and green space, and open your mind. Start helping with the task of making American towns and neighborhoods magnificent places to live and work, and move downtown yourself, even if you have to give up one of your mighty SUVs. The antidote to America’s terrible urbanism is, simply, good urbanism." Thank you for this. I am fighting the same fight in my community - why is it so hard to "get?" Keep up the fight Wes! Well worth it, especially since, as you noted, very few understand the importance of protecting the human habitat. Quit trying to make the suburbs the Bad Guy! Suburbs were a highly responsible social and engineering response to previous centuries of over-population of cities. The reduction in density and separation of individual suburban homes was rooted in the need for fresh air to prevent historic epidemics of yellow fever, malaria, etc. The extra space provided room for children to play, pets to roam, places to hang laundry, make treehouses, etc. without being on top of your neighbor. The suburbs preserved more green space per acre than any other living mode previous to that time and allowed the "Common Man" not just the rich, to enjoy elbow room, room for a car to park off of the road and a chance to get away from the constant activity of the sidewalk and street. The suburbs were the final step in providing dignity for all those willing to work hard. The suburbs are the trophy and achievement of the American working man. As the late Governor Huey Long said (and I paraphrase) "Every man a king!" Not everyone wants to live in an upstairs loft or city dwelling. I Love the Suburbs, Kiss my Grass! Thank you for your comment. Yes the suburbs were a great idea; who doesn't want green grass, fresh air, places to roam? Many suburbs are still great places to live. 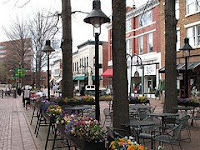 DelRay, one of the original suburbs outside Alexandria, VA, has all these things plus a Main Street, access to public transportation, endless shady sidewalks. It's not about not building suburbs. It's about building Places -- whether they're urban, suburban, or rural -- where people can walk. Where their children can play. Where residents, of all economic backgrounds, can actually know their neighbors and feel part of a community. Many of today's prototypical suburbs just don't do that, and Americans deserve better. Awesome style. I would like to write that way.